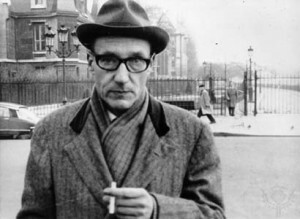 You can now find some new writings of the Beat author William S. Burroughs on eBay. What's up for bid here is not a long lost novel, or an early draft of Naked Lunch. Nope, it's simply Burroughs' shopping list, a little note reminding him to pick up some cans of Coke, cat food, vodka, Triscuits, and other banal things. Buy it here for a cool $495. All credit on this one goes to BoingBoing, which, by the way, is also featuring today a free download of Sean Williams' Darwinian religion novel Crooked Letter.